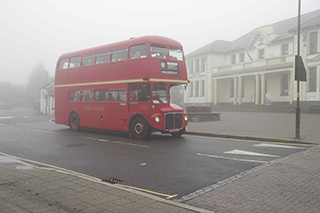 The SDR Trust Museum Support Group hired the railway’s Routemaster bus on Saturday 21 September. 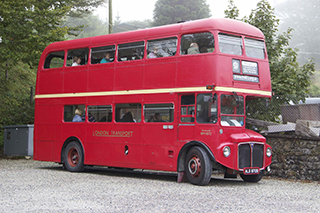 It was used for an outing to Dartmoor, open to anyone interested, and in the end 36 people enjoyed the day, plus driver John Keohane and conductor Mike Smoker. The itinerary took the group first to the Dartmoor Prison Museum, situated almost opposite the main entrance to the famous prison. It is a fascinating experience, and everyone enjoyed it very much. There was, however, one escapee who was seen being smuggled out by Dave Knowling, and who is likely to make an early appearance at Pixie Falls. On to the Plume of Feathers or Foxtor cafe for lunch, and by this time the bright sunshine of Buckfastleigh was but a memory – the Dartmoor mist had come down with a vengeance. 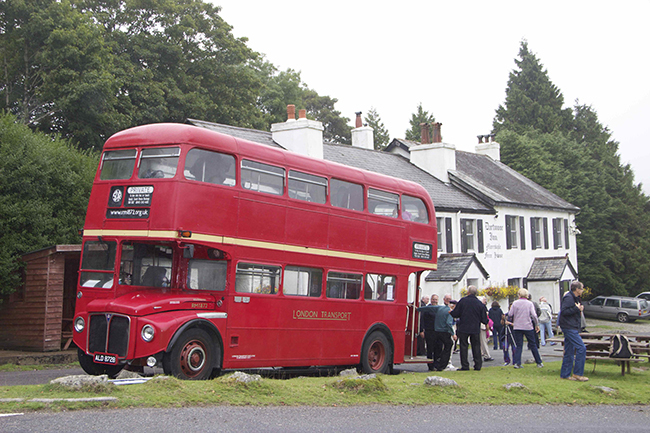 The bus then took the party on to the Dartmoor Inn at Merivale, where Dave Knowling was able to tell people about some of the industrial archaeology of the area, and about life there when he was a child: he was born next door to the pub. After partaking of further refreshments - including cream teas in many cases - the party then went on to Tavistock, returning to Buckfastleigh from there. The outing was enjoyed by everyone who came along: many thanks to the bus crew for all their hard work. Further outings are planned: the next one is likely to be just after Easter 2014, and will feature a different museum or industrial site, and further chances to sample local Devon hospitality. 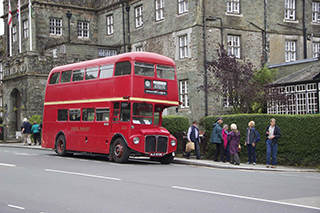 The photos show Dave Knowling (that’s the easy one), and the bus at each location - Prison Museum, Princetown (outside the visitor centre), Dartmoor Inn, Merrivale and outside the Bedford Hotel, Tavistock.